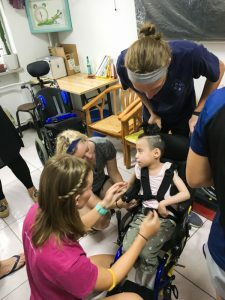 We’ve been on two visits to the orphanage in Dachang to see Francis, Cody, and Maya. These three kiddos were recalled to Dachang a little prior to the mass exodus of our children last summer. The purpose and focus of our first visit was to train the caregivers on safe feeding for Maya. Her ayis were very attentive and quick to learn, and upon our second visit, we were pleased to see that Maya had gained weight and her caregivers were following our instructions very well. During that second visit, a team of visiting physical therapists helped us deliver and fit Maya in a new wheelchair. We were also delighted to see that Cody and Francis are thriving in school and are very proud of the cool room they share together—it even has a TV!